WHAT IS INFANT MASSAGE ? In our busy world today many adults have learned the benefit of a massage. It has become a treat to indulge in while on vacation, a part of healing an injury while in physical therapy, or a way to reduce the stress of daily life. There is also an increasing awareness of the benefits of massage for babies. Many new parents are now seeking instruction in the art of massage for their baby. However, massaging your baby is a custom that has a very long tradition in some cultures such as India and Sweeden. They knew the benefits of a daily massage for baby and passed down the technique from one generation to the next. In her book Infant Massage: A Handbook for Loving Parents, author Vimala McClure shares the technique she evolved after spending time volunteering in an orphanage in India and learning about the benefits of massage for babies. McClure’s book is considered a classic and her technique is taught internationally. 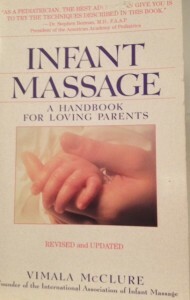 McClure’s book is complete with step-by-step instructions of her massage technique for babies. Beautiful photos illustrate each of the strokes along with clear and detailed instruction. How to choose a good massage oil, how to massage a baby with special needs, and how to adapt the massage for the baby as she becomes more physically active and grows older are also topics of discussion. This book makes a wonderful gift for a new mother. You might include a gift certificate for a series of classes in infant massage with a local instructor. Contact Infant Massage USA for an instructor in the United States or the International Association of Infant Massage (founded by Vimala McClure) for an instructor in your country. Both organizations teach Vimala McClure’s method. The gift of nurturing touch is a beautiful gift. Infant Massage: A Handbook for Loving Parents: by Vimala McClure (New York: Bantam Books, 1979). This entry was posted in BOOKS FOR PARENTS and tagged 1-3 months, 3-6 months, newborn, sleep, touch. Bookmark the permalink.